We have added Education at Alexander Street Press to our catalogue and A-Z list. UK-based Teachers TV has been producing instructional videos since 2008 and was government funded until the site closed down in 2011. Alexander Street Press has licensed this material and is pleased to make it available free to all libraries in the UK and Ireland. Education at Alexander Street Press focuses on the development and training of teachers. Content includes primary-source footage of students and teachers in actual classrooms, demonstrations, lectures, and documentaries to help both new and experienced teachers develop their abilities to teach, mentor, understand, and communicate with students of all levels of need and a list of the titles available in this collection is available here. This entry was posted in New e-resources and tagged Alexander Street Press, Education, Teachers TV, Video package on November 25, 2014 by eresources. We have trial access to Oxford Historical Treaties until the 24th December. 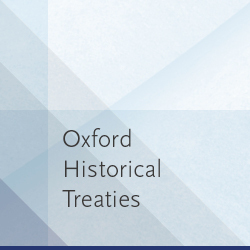 Oxford Historical Treaties (OHT) is the premier resource for historical treaty research and home to the full text of Parry’s Consolidated Treaty Series, the only comprehensive collection of treaties of all nations concluded from 1648 through 1919. Available via the Oxford Public International Law platform, OHT is cross-searchable with Oxford’s leading public international law resources and benefits from a modern, intuitive interface and sophisticated functionality. This trial also includes access to the Oxford Law Citator and we are also currently trialling the Oxford Reports on International Law until the 28th February 2015. This entry was posted in Trials and tagged Law, Oxford Historical Treaties (OHT), Oxford Public International Law, Parry’s Consolidated Treaty Series on November 24, 2014 by eresources. We have trial access to the Mental Measurements Yearbook until the 21st December. The Mental Measurements Yearbook is a guide to over 3,000 contemporary testing instruments. Produced by the Buros Center for Testing at the University of Nebraska, entries contain descriptive information (e.g., test purpose, publisher, pricing, population, scores) and edited review(s). To be included, a test must be commercially available and published in the English language. 1938 onwards. This entry was posted in Trials and tagged Buros Center for Testing, Ebsco, Mental Measurements Yearbook on November 24, 2014 by eresources. We have trial access to psycINFO and psycARTICLES via the Ebsco platform until the 21st December. We currently have access to both of these databases via the Ovid platform, we are interested in gaining feedback on using these databases on the Ebsco platform. PsycINFO – 1806 onwards. Abstracts, citations and controlled vocabulary for contents of approximately 2,500 journals publishing behavioural science and mental health. PsycARTICLES – Full-text from APA journals (mostly volume 1 onwards) and related imprints. Indexed in PsycINFO. We are interested to know what you think of this platform to access these databases as your comments influence purchase decisions so please do fill out our feedback form. This entry was posted in Trials and tagged databases, Ebsco, Ovid, PsycARTICLES, Psychology, PsycINFO on November 24, 2014 by eresources. We have trial access to Digital Theatre Plus until the 20th December. This resource offers 54 high-definition films of acclaimed British theatre productions, 100 interviews with UK’s leading actors and directors revealing how theatre professionals transform text into live performance, as well as study guides written by experts in drama providing in-depth analysis and interpretation of dramatic writing and language. A list of the productions on Digital Theatre Plus and a preview clip is also available. This entry was posted in Trials and tagged Digital Theatre Plus, Drama, Video package on November 24, 2014 by eresources. This entry was posted in Trials and tagged Dictionaries, Italian, Zanichelli on November 21, 2014 by eresources. We have trial access to Sinica Sinoweb until the 20th December. This entry was posted in Trials and tagged Academia Sinica, e-journals, Sinica Sinoweb, Taiwan on November 21, 2014 by eresources. We have trial access to the Chinese Electronic Periodicals Services (CEPS) and Chinese Electronic Theses and Dissertations Service (CETD) until the 20th December. The CEPS/CETD database platform provides full-text access to over 4,300 academic journals from China Mainland (2,600) , Taiwan (1,500) and other areas (254), with 2.6 million articles; it also provides full-text access to over 200,000 doctoral theses and masters dissertations from over 58 universities in Chinese speaking regions including Taiwan, Hong Kong, Macao and China Mainland. The collection date is from 1991 onwards.. The database has been indexed both in traditional and simplified Chinese characters. This entry was posted in Trials and tagged Chinese Electronic Periodicals Services, Chinese Electronic Theses and Dissertations Service, Dissertations, e-journals, Theses on November 21, 2014 by eresources.